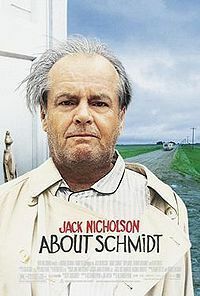 About Schmidt is a 2002 American film directed by Alexander Payne and starring Jack Nicholson as Warren Schmidt and Hope Davis as his daughter Jeannie. It is loosely based on the 1996 novel of the same title by Louis Begley. Many of the scenes were filmed on location, especially in Omaha, Nebraska and Denver, Colorado. According to the special features on the DVD, a number of non-professional local residents appeared in the film, portraying their real-life professions. The actual Woodmen of the World headquarters building in Omaha was utilized in the film. The main narrative of the film follows Schmidt as he goes on a road trip in order to attend the wedding of his only daughter to a man and into a family he does not particularly like.